Professional Technical Analysts often argue if you know your Charts well, you can see much beyond the price. It is sometimes wonderful to see that even if one is not completely aware of the fundamental inputs; Market Participants know it all and it all gets discounted in the price. In other words, Charts reflect all. The fundamentals picture, the psychology and the consensus of the Market Participants. 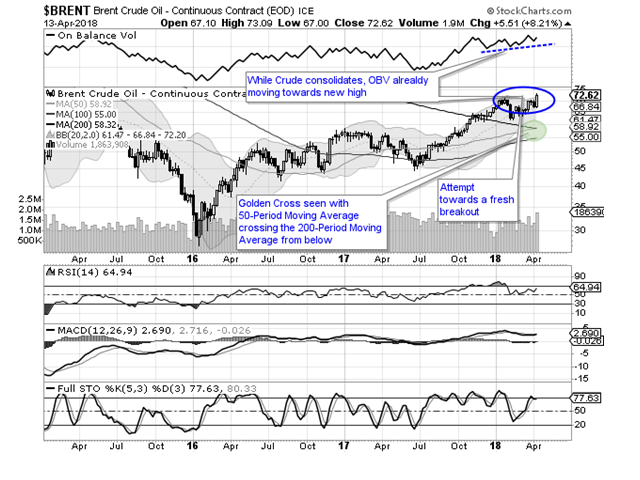 Once such good example is the Brent Crude. 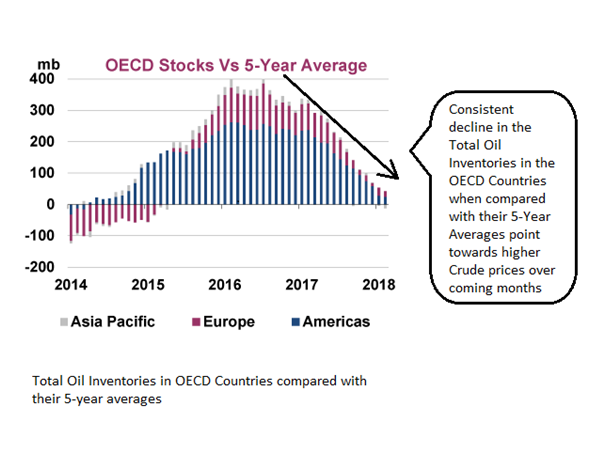 The below picture shows how the total Oil inventories of the OECD countries peaked in 2016 and after that it shows how consistently it has dropped ever since. 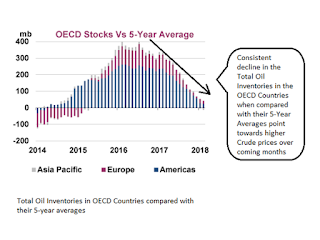 When compared against their 5-year averages, the OECD stocks are seen consistently reducing and very near to getting into negative. One would not require Einstein’s brain to understand that the glut of stored oil among industrialized economies – which helped keep prices low for years – has shrunk after production cuts by OPEC and Russia. This has not only set prices higher but it is likely to push it higher significantly over coming week. This gets wonderfully reflected on the Technical Charts. Let us examine the Weekly Technical Charts of Brent Crude and see how wonderfully it corroborates the above picture and reflects all that we discussed above. The below Chart gives several indication which point towards up move in prices of Brent Crude over coming weeks. · After good accumulation, a big white candle appearing near the 20-Period Moving Average point towards attempt for a fresh break out. · On Balance Volume – OBV is moving towards a fresh high while the prices consolidate. This shows inherent buoyancy. · Prices ended above their upper Bollinger band. Though some temporary retracements inside the bands may be seen but this also point towards likely initiation of a fresh up move in prices. 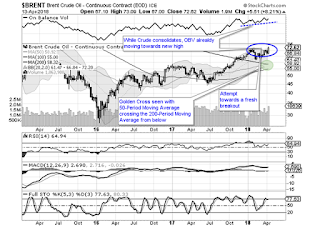 It would be no surprise if we see Crude prices moving higher over coming weeks.